Below are the undercard results from the Kubrat Pulev-Bogdan Dinu / Jessie Magdaleno-Rico Ramos doubleheader at The Hangar in Costa Mesa, California Saturday night (Sunday in Manila) promoted by Top Rank and broadcast by ESPN. 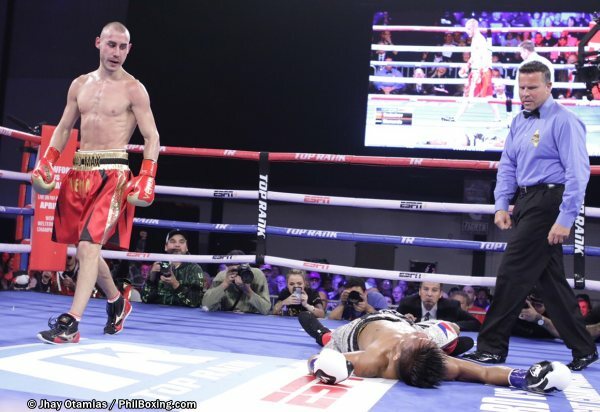 5th fight: Maxim 'Mad Max' Dadashev (13-0-0, 11KOs) of St. Petersburg, Russia knocks out Ricky Susmundo (35-13-3, 17KOs) of Bohol who is now based in Japan in a slambang affair. 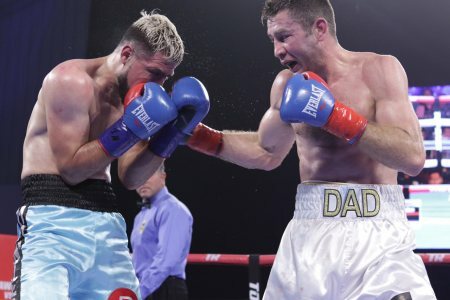 Sismundo dropped the Mad Max in the second round with a straight left and in the 4th round Dadashev returned the favor by sending Sismundo to the canvas for good with a left-right combo. Maxim Dadashev of Russia flattens Ricky Sismundo of the Philippines. 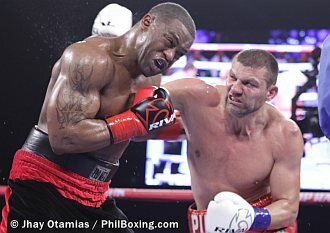 4th fight: Tervel Pulev (13-0-0, 11KOs) of Sofia Bulgaria and brother of Kubrat Pulev who is fighting on the main event, won via unanimous decision against Mitch Williams (16-8-3, 11KOs) of Jackson, Michigan in a close contest of their 6-round scheduled cruiserweight bout. Scores: 59-54, 58-55, and 57-56. Javier Molina decisions Abdiel Ramirez. 3rd fight: 2008 U.S. Olympian Javier Molina (19-2, 8 KOs) of Norwalk, California won via unanimous decision over Abdiel Ramirez (24-4-1, 22 KOs) of Mexico in their 8-round scheduled super lightweight bout. Scores: 78-74, 78-74 and 79-73. Chris Heerden of South Africa wins by technical decision over Mahonri Montes of Mexico. 2nd fight: Chris “The Heat” van Heerden (28-2-1, 12 Kos) of Johannesburg, South Africa won via technical decision over Mahonri Montes (35-9-1, 24 Kos) Los Mochis, Mexico in their welterweight contest. 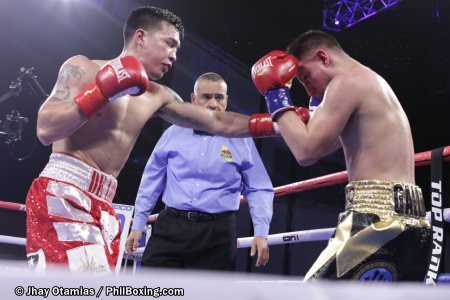 Montes was cut in the eye in the sixth round and could not continue and they went to the scorecards. Heerden won on all three judges scorecards with identical 60-54. Erick de Leon of Detroit wins over Jose Luis Gallegos of Mexico via 7th round KO. 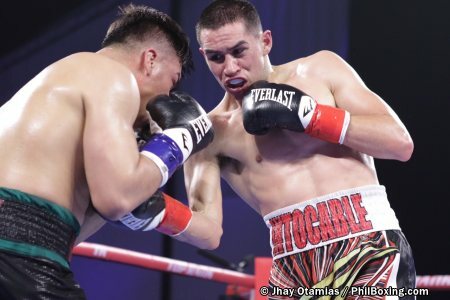 1st fight: Erick De Leon (19-0-1, 11 KOs) of Detroit, Michigan stopped Jose Luis Gallegos (16-6, 12 KOs) of La Barca, Jalisco, Mexico in the seventh round of their eight round scheduled featherweight bout. David Kaminsky decisions Estevan Payan. 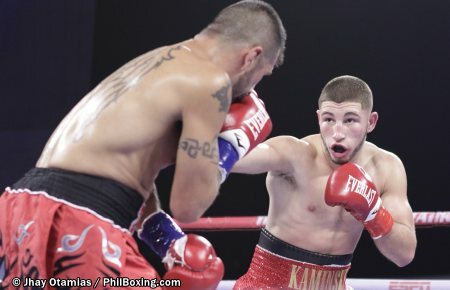 In a swing bout on the 6th fight, David Kaminsky (4-0-0, 2KOs) of Israel won via unanimous decision over Estevan Payan (1-7-1, 1KO) of their 4-round middleweight bout.